A collaboration with the Soho House group, The Apartment is set to shake up the London meeting room scene, designed as a vibrant, fun space rather than an office. The Apartment has its own front door with letter boxes on the wall to house each company's collateral and once inside guests can take advantage of the communal kitchen pantry with a whole host of complementary refreshments and snacks. 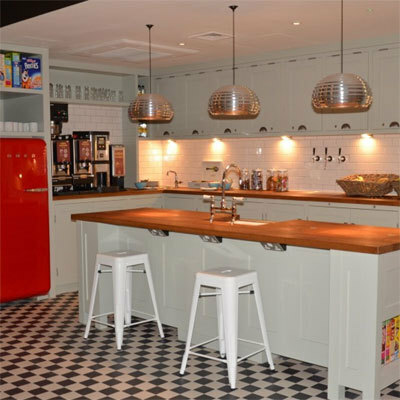 Highlights include a red Smeg fridge fully stocked with soft drinks, jars filled to the brim with retro sweets, a wide selection of hot drinks, chocolates and biscuits. By night, The Apartment changes in to the ultimate event space which sees the kitchen transform into a fully stocked bar with a DJ booth, record decks, a Bose sound system, and a late licence. The six rooms feature a range of eclectic bric a brac, designer prints and modern lighting whilst all are fully kitted out with Samsung flat screens, free wi-fi, free local calls and meeting room equipment. Guests can choose from: The Library, The Living Room, Study, Dining Room and Play Room which hold between 10 and 20 people. Movable walls mean that larger gatherings are also well catered for with a maximum event capacity of 200 people. With its slick New York loft feeling, excellent service and vibrant ambiance, The Hoxton's Apartment is ideal for meetings, brainstorming sessions, presentations and team catch ups by day and the hippest destination for exclusive events and private parties when the sun goes down. Meeting rooms are £65 pp Inc VAT, including full access to the kitchen pantry. To book contact Meet[at]thehox.com. For more information, visit hoxtonhotels.com.